Messier 26 (M26) is an open cluster located in the constellation Scutum. The cluster has an apparent magnitude of 8.0. Messier 26 lies at an approximate distance of 5,000 light years from Earth. Its designation in the New General Catalogue is NGC 6694. The cluster occupies an area of 15 arc minutes, corresponding to a linear diameter of 22 light years. The brightest star in M26 has a visual magnitude of 11.9 and the spectral classification B8. 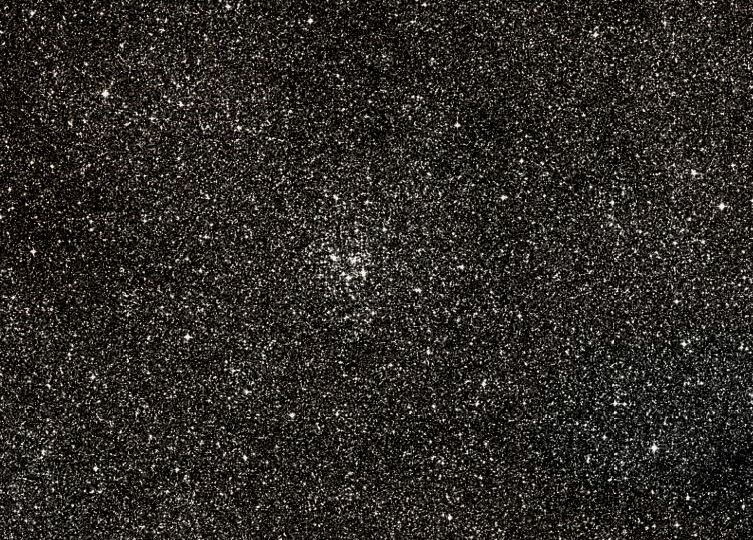 The estimated age of the cluster is 89 million years. M26 can be a challenge to find and does not provide as impressive a view as the nearby Wild Duck Cluster (M11). M26 lies only a degree to the southeast of Delta Scuti, a peculiar giant star with the spectral classification F2, that serves as a prototype for a class of pulsating variable stars known as the Delta Scuti variables. The star has an average visual magnitude of 4.71. 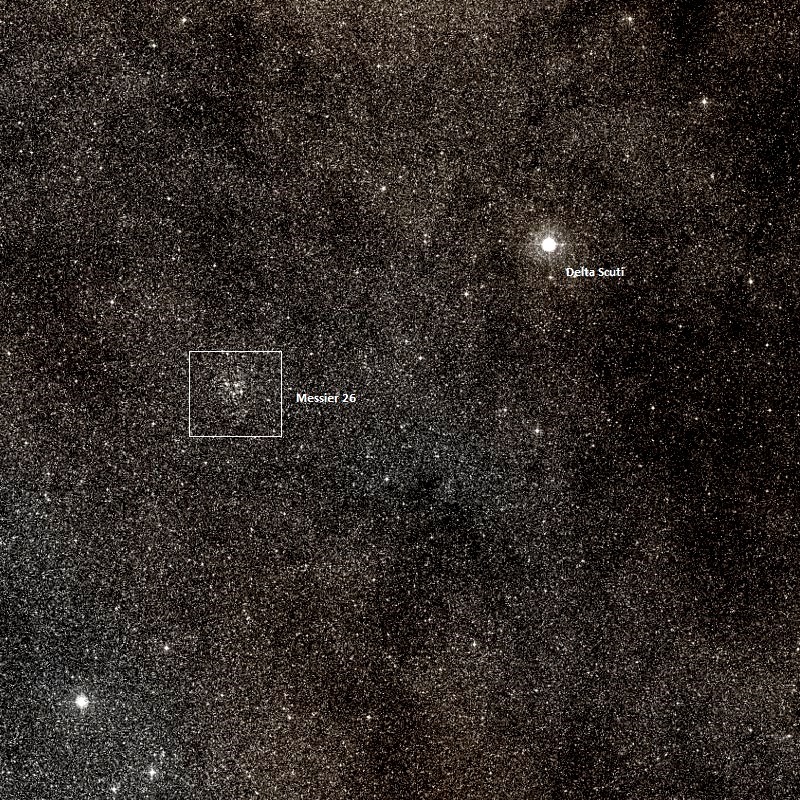 It is one of the two relatively bright, naked-eye stars near M26. 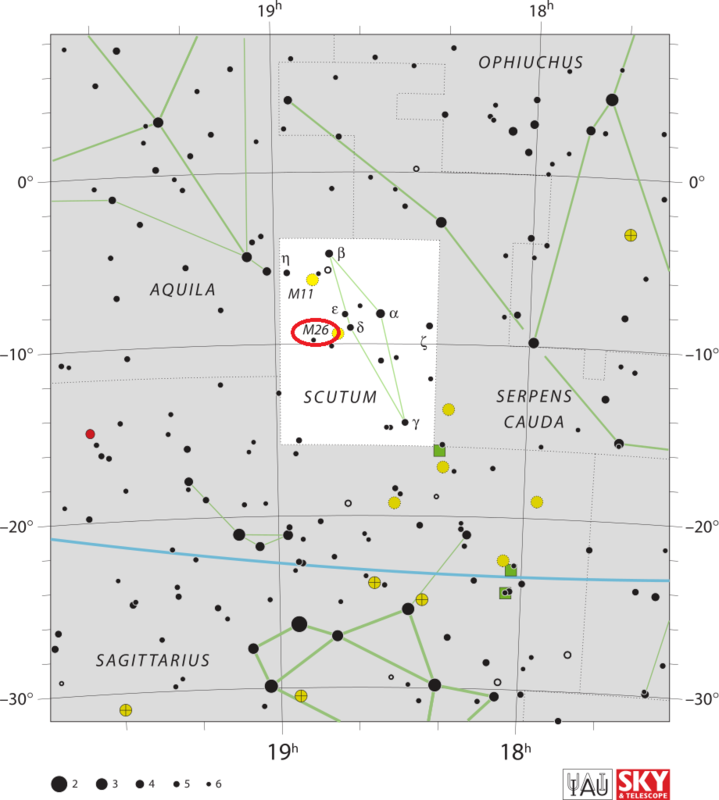 The other star, Epsilon Scuti, has an apparent magnitude of 4.88 and lies slightly north of Delta Scuti. Messier 26 can also be found by first locating the bright Altair in the constellation Aquila and extending the line formed by the stars that mark the celestial eagle’s back in the direction of the Teapot in Sagittarius. 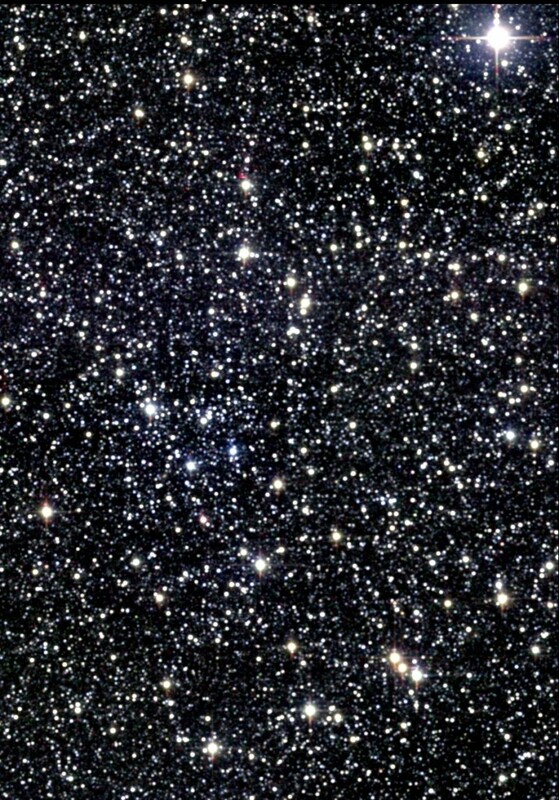 The cluster is not visible to the naked eye, but will appear as a compression of stars in 10×50 binoculars. Small telescopes will reveal a compact star cluster, and 6-inch and 8-inch telescopes will resolve about 25 brightest stars. The cluster contains a total of about 90 members. The best time of year to observe it is from June to September. Messier 26. Atlas Image mosaic obtained as part of the Two Micron All Sky Survey (2MASS), a joint project of the University of Massachusetts and the Infrared Processing and Analysis Center/California Institute of Technology, funded by the National Aeronautics and Space Administration and the National Science Foundation. Messier 26 is notable for a region of low star density near the cluster’s centre, likely a result of a cloud of interstellar dust blocking the light of the stars from our view. The low density zone is 3.1 arc minutes in diameter and located at the centre of the cluster. In the same night [June 20 to 21, 1764], I discovered another cluster of stars near n & o of Antinous, among which there is one which is brighter than the others: with a refractor of three feet [FL], it is not possible to distinguish them, it requires to employ a strong instrument: I saw them very well with a Gregorian telescope which magnified 104 times: among them one doesn’t see any nebulosity, but with a refractor of 3 feet & a half, these stars don’t appear individually, but in the form of a nebula; the diameter of that cluster may be 2 minutes of arc. I have determined its position with regard to the star o of Antinous, its right ascension is 278d 5′ 25″, & its declination 9d 38′ 14″ south. A small and coarse, but bright, cluster of stars, preceding the left foot of Antinous, in a fine condensed part of the Milky Way; and it follows 2 Aquilae by only a half degree. The principle members of this group lie nearly in a vertical position with the equatorial line, and the place is that of a small pair in the south, or upper portion of the field [in telescope]. This neat double star is of the 9th and 10th magnitudes, with an angle [PA] = 48 deg, and is followed by an 8th [magnitude star], the largest [brightest] in the assemblage, by 4s. Altogether the object is pretty, and must, from all analogy, possess affinity among its various components; but the collocation and adjustment of these wondrous firmamental clusters, and their probable distances, almost stun our present faculties. There are many astral splashes in this crowded district of the Galaxy, among which fine specimens of what may be termed luminiferous ether, are met with. Cluster of the VII. class [after William Herschel, “Compressed clusters of small and large stars”]; pretty rich; irregularly round; pretty well insulated; not much compressed toward the middle; 10′ diameter; stars from 12th to 15th magnitude; [position of] one of 9m taken.